During the course of this semester my perception on the different social media user accounts, has completely changed since the first day of semester. When started the class the only social media I had ever used was Facebook to connect with friends and family. My purpose was purely recreational use to share images, content and video clips that had been shared million and one times. I never really put too much thought into the potential of social media and how it can grow your business quickly and efficiently. The analytics that that are available for all social media is amazing how many metrics are closely followed and used to gear business practices in the right direction. Learning how to use these features and benefits offers many paths to grow the business in variety of metrics. Google analytics is a very complicated formulation of specific metrics which are used to help drive traffic to domain name. As a novice I found all of these statistics to be confusing over bearing to my food trucks ability to generate organic traffic. Google optimization has the distinct ability to test all areas of my social media sites testing content such as text. Images and video. These metrics will help me to maximize my search ability in comparison to other businesses in similar marketplace.Data Activation would be useful feature to track my demographics of the customers visiting my food truck.The more I understand about purchasing and inventory control the more on point my service processes will connect. Niccos Grecko Gyros, will use several advertising strategies. We will find multiple outlets to get our content across to our site visitors. Keeping content fresh, and relevant for opt in subscribers will keep our potential customers engaged. Focusing on the products, and services, and location map selling, will be at the fore front of our efforts. Facebook offers variety of options to directly target specific marketing and advertising criteria. Friends of connection ads has the ability to promote fan base metrics through the power of likes. Greatest asset available is targeting culmination of social media friends. Driving traffic to my social media platforms on Facebook, Twitter and Tumblr with highest quality blogs and content provided. 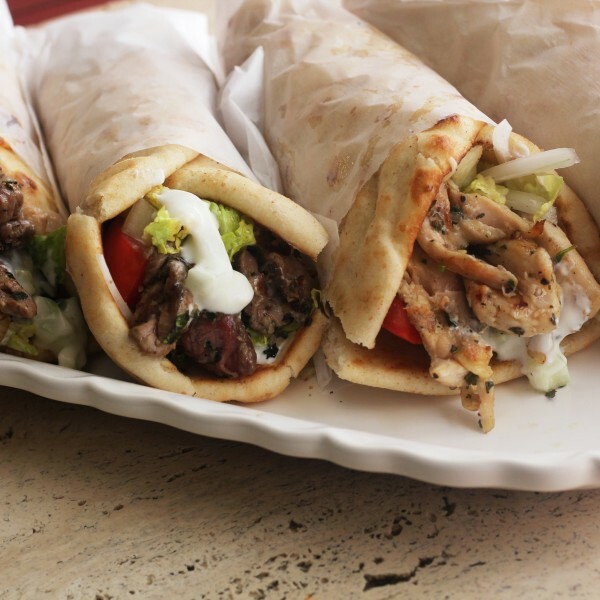 Niccos Gyros mission is to share our home cooked Gyros in family friendly environment. 1.Find 5 businesses similar to yours and study the social advertising they use. In your opinion does their advertising seem effective? Happy Earth Day and remember, the little things you do can make a big difference to make our world a more beautiful and "feta" place. Welcome Email: Share our Family Story, and offer limited time exclusive coupon. Monthly Promotions: We will have new menu item highlighted each month. Birthday Month Incentives: Free Gyro on Birthday as newsletter subscriber. Health and Fitness Blog: Monthly blog and tutorials on healthy lifestyles. Customer Surveys: Guests have opportunity to share thoughts, feelings and areas of opportunity. Local Community Events: Listing of local SD venues, Farmers Markets, Street Fairs, Mobile Food Truck Events. 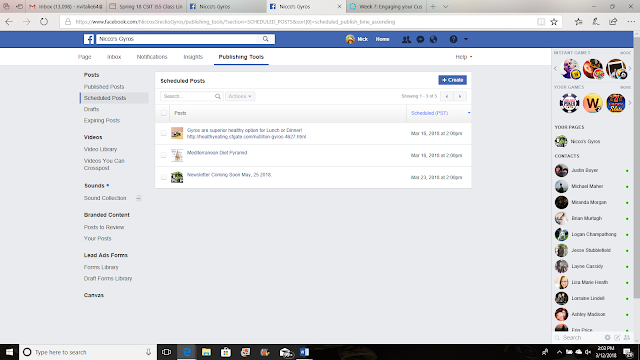 Blog Post: Post a screenshot of your activity for the posts ahead (located in Activity Log) and explain why you think these posts will engage your audience. To find your scheduled content, go to the top of your page and above your admin panel. Click Edit Page and scroll down to Use Activity Log. Here you can see your upcoming posts and make edits as well. Post reach is measurement, of the range of influence published content that is posted on social media sites. This measurement of content is spread across multiple social media platforms. The ultimate goal, is to get as many viewers possible to read the content. There are several tiers, which social media visitors can be classified. Organic postings, paid content, advertising and market ads. When information has be filtered to all users across the social media spectrum. Slang gone “viral” is commonly reported by media sources when specific content is widespread for all users. Post engagement, is measurement of action, taken by users on the posts. For example if you followed a company profile, on Instagram, or liked content on Facebook. Purpose is to engage visitors, with visually stimulating color schematics, and high resolution images, focusing on strategic content, ex: comment boxes, promotions, coupons and newsletters.